To Cite: Turker K, Tas B, Ozkaya M, Tas E, Caglar A, et al. Dystrophic-Anagen Effluvium Occurring During Pegylated Interferon-α-2a/Ribavirin Therapy, Hepat Mon. 2015 ; 15(3):e24804. doi: 10.5812/hepatmon.24804. Introduction: Various types of dermatological manifestations have been reported due to hepatitis C virus (HCV) infection and anti­HCV therapy. Some of them have been described during IFN-based therapies. PEG-IFN-α-2a/RBV combination is used as the international standard of treatment for HCV infection for a long time. The combination therapy yields an adverse-event profile similar to standard interferon (IFN) therapy. Some of these adverse effects are rheumatologic, neuropsychiatric and dermatological manifestations including alopecia. Case Presentation: We reported a 43-year-old woman with dystrophic anagen effluvium (DAE), rheumatoid arthritis and Hashimoto thyroiditis, which were developed under the combination therapy for chronic HCV infection. 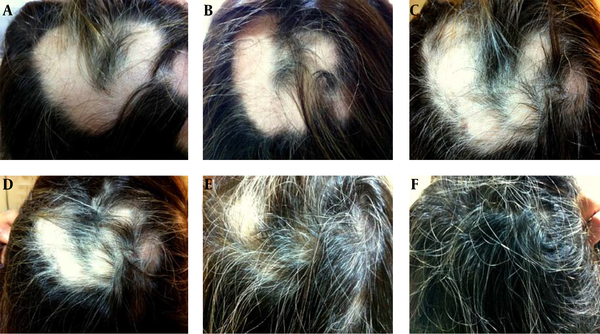 Conclusions: Although some cases of alopecia areata (AA) and telogen effluvium (TE) were reported in literature, no case of DAE associated with PEG-INF-α-2a /RBV combination therapy was reported previously. PEG-IFN-α-2a/RBV combination therapy is used as the international standard of treatment for HCV infection for a long time. The combination therapy yields an adverse-event profile similar to the standard interferon (IFN) therapy. These adverse effects include hematological, cardiovascular, endocrinological, rheumatologic, neuropsychiatric, digestive and dermatological manifestations, which are sometimes so severe able to restrain the therapy (1). Some adverse effects are also suspected to be an autoimmune character such as alopecia and thyroid disorders (1). Hair disorders including reversible hair discoloration, hypertrichosis, straight hair, effluvium (alopecia), diffuse thinning of the hair, hair curling, repigmentation of grizzled hair, trichomegaly of the eyelashes have been described during IFN therapy (1, 2). A 43-year-old woman was admitted with chronic HCV infection approved by positive anti-HCV antibody and HCV-RNA and two-fold increase in maximum transaminase levels for previous six months. According to family and personal history of the patient, her uncle died of complications of cirrhosis and she had no chronic disease previously. Physical examination had normal findings. Viral load was 1580000 copies/mL. HCV genotype was 1b. Anti-HCV treatment started in August 2012 with 180 mcg of PEG-IFN α-2a subcutaneously once a week in combination with RBV 1000 mg/daily for a 48-week course. She had an early virological response (EVR), because HCV RNA level was undetectable and the serum aminotransferase levels returned to normal in the second month of therapy. In the seventh month, the patient complained of insomnia and joint-pains on her wrists and ankles. In physical examination, there were mild swellings on the back of the both hands, wrists, metatarsophalangeal (MTF) and proximal inter phalangeal (PIF) joints, and tenderness in the related joints. Ranges of motion were normal. In laboratory tests, anti-cyclic citrullinated peptide (anti-CCP) and C reactive protein (CRP) levels had positive results (59.76 U/mL and 8.54 mg/L), but RF had negative finding. She was diagnosed with rheumatoid arthritis (RA). After the treatment with prednisolone 5 mg/day, naproxen 750 mg/day (15.04.2013) for one month, the symptoms regressed by 50%, and after ceased the INF and RBV treatment the symptoms were alleviated. Treatment with methotrexate 2,5 mg/week, folic acid 5 mg/week and prednisolone 5 mg/day was changed in 22.07.2013. On the ninth month of therapy, the patient complained of patchy-hair loss (03.06.2013). Dermatological examination revealed two circumscribed alopecic areas, which included “V” shaped 16 × 14 cm on the vertex and occiput and ovoid and 3×3 cm on the right parieto-occipital region. On alopecic areas, there were no vellus or miniaturized hairs and no exclamation mark hairs. No scaling, erythema, scarring, atrophy or induration was seen (Figure 1A, 1B). Hair pull test had positive results. In laboratory examinations, glucose, HbA1C, Fe, ferritine, vitamin E, Zn, 25-hydroxy vitamin D3, 1-25-dihydroxy vitamin D3, IgG subtypes, TSH, thyroid function tests,FSH, LH, progesterone, DHEA-S, SHBG, prolactin, testosterone, parathormone and complement levels (C3, C4) all had normal findings. Rose-bengal, Wright agglutination, RF, VDRL, antinuclear, anti-mitochondrial and anti-smooth-muscle antibodies, ENA profile and antithyroglobulin antibodies had negative results, but antibodies against thyroid peroxidase (TPO) were elevated (263.3 IU/mL) and E2 was low (11.8 pg/mL). Anti-CCP and CRP were still at high levels (48.72 U/mL, 6.44 mg/L). Ultrasonography showed enlargement of thyroid gland, hypoechoic and heterogeneous appearance and two nodules on the right lobe. Hashimoto thyroiditis (HT) was diagnosed for the patient. She had been received no therapy for it and decided to get follow-ups. In the trichogram, the ratio of anagen, dystrophic anagen, telogen and catagen hairs were 32%, 50%, 14% and 4%, respectively. Histopathological examination of excisional scalp biopsy showed a normal number of catagen-follicles in the dermis. There were no anagen-hairs on the alopecic patches and no inflammation in the periphery of the follicles (Figure 2 A, 2 B). Based on clinicopathological and trichological findings, DAE was diagnosed. Because of severe alopecic adverse effect and early virological response, the treatment was stopped after getting an informed consent from the patient at 42 week. Although INF therapy was discontinued, anti-CCP level increased and RF became positive (145 U/mL, 31.7IU/mL), elevated anti-TPO levels remained high (239.3 IU/mL) and virological response persisted for seven months after the termination of therapy. Hair regrowth began within three weeks (Figure 1C, 1D). Four months later, she had a sustained virological and biochemical response and hair regrowth was completed (Figure 1F). HCV RNA level was undetectable during the whole treatment period and the patient had still sustained virological response 14 months after the cessation of therapy (21.07.2014). At the time of writing the manuscript, she was still under follow-up and HCV RNA level was controlled every six months. She was operated for thyroid gland disease in 2013. Her anti-CCP level and RF still had positive results (> 300 U/mL, 29 IU/mL), therefore she was under control of our rheumatology department (21.07.2014). A, B, Ninth month of the combine therapy; C, D, 3 weeks later; E, 7 weeks later, and F, 4 months later cessation of the therapy. A, B, Histopathological examination of an excisional scalp biopsy showed a slight orthokeratosis in the epidermis and a normal number of catagen follicles in the dermis. There was no anagen hair on the alopecic patches and no inflammation on the periphery of the catagen follicles. The findings were consistent with an anagen effluvium (AE). Alopecia is a frequent adverse effect of PEG-IFN-α-2a/RBV combination therapy in 19% of reported patients (2). Drug-induced hair loss can be TE, DAE, dystrophic-telogen effluvium (DTE) or anagen effluvium (AE) according to the degree of toxicity in the hair molecules and the types of affected hair cycles (3, 4). INF-therapy related alopecia types are TE, localized alopecia (LA) at the injection site, alopecia areata (AA) and alopecia universalis (AU) (1). TE is characterized by excessive loss of telogen-hair. It usually occurs in some metabolic deficiencies or diseases such as iron, vitamin B12, folic acid deficiencies, high fever, hypothyroidism and hyperthyroidism (3, 5) in approximately 30% of patients treated with IFN (1, 6). Hair pull test has negative results. The percentage of telogen-hairs is abnormally high compared to the percentage of anagen-hairs. The A/T ratio (normally is 80-85/15-20) is low. The percentage of dystrophic-hairs is normal and the percentage of catagens sometimes increases (3, 5). LA has been characterized by local hair loss at the injection site. It develops following an inflammation at the injection site. AA is characterized by circumscribed, noninflammatory and nonscarring alopecia. AU is a severe form of AA, which hair loss extends over the whole skin (1). There are published cases of AA during or after treatments with warfarin, cyclosporine, rifampicin, zotepine and zidovudine (6). Hair pull test has positive results and exclamation mark hairs are shown at alopecic patches (3, 5). AE is a prominent adverse effect of antineoplastic agents, which is caused by acute damage of rapidly dividing hair matrix cells. The best-known drugs are antimetabolites, alkylating agents and mitotic inhibitors such as adriamycin, cyclophosphamide and etoposide (7). AE occurs after any insult to the hair follicle that impairs its mitotic or metabolic activity. Inhibition of cell division in the hair matrix can lead to a weakened segment of hair shaft susceptible to fracture. The hair bulb itself may be damaged. The follicles should show no signs of inflammation, dystrophic changes of the inner sheath or traction. These features allow distinction of AE from AA, androgenetic alopecia and traction alopecia. Only actively growing anagen follicles are subject to these processes. This form of alopecia is more common and severe in combination chemotherapy than monotherapy (8). In AE and DAE, the shedding course starts within days or weeks, which is much earlier than TE. The hair pull test has positive result for dystrophic anagen hairs with tapered ends. If the insult ceases, hair growth restarts in weeks. Moreover, in “DAE” the growth of anagen hairs usually ends prematurely due to the absence of mitoses within the matrix. The distal part of the hair takes on a characteristic pointed, discoloured aspect with no matrix or shaft. The number of dystrophic anagen hairs is normally observed below 2%. In DAE, the percentage of dystrophic hairs is higher compared to the percentage of normal anagen hairs due to acute alteration of the function of the matrix. The percentage of telogens usually remains normal (3-5). Moreover, Yun et al. reported that chemotherapy-induced AE could be diffuse or patterned. They also found no significant differences in hair loss patterns according to age, associated symptoms or combination of chemotherapeutic agents (7). Trueb stated that the chemotherapy-induced alopecia presents with different clinical patterns of hair loss. When an arrest of mitotic activity occurs, obviously numerous and interacting factors influence the shedding pattern (8). Because hair-shedding of our patient was a patterned alopecia and hair pull test had positive results, we firstly thought that the alopecia could be an AA. However, due to absence of exclamation mark hairs and perifollicular inflammation and presence of a large number of dystrophic-anagen hairs, this diagnosis was ruled out. TE was excluded, because the clinical presentation of alopecic lesions was not similar to a TE, also absence of previously mentioned significant metabolic causes, positivity of hair pull test, normal number of telogen hairs and increased dystrophic-anagen hairs. AE can be distinguished from TE by means of hair pull test (5). The pull test of our patient had positive result; therefore, we secondly thought that the alopecia could be an AE. Although, hair loss usually occurs within days to weeks of drug administration in AE (9), the effluvium of our patient began nine months after beginning INF therapy and this starting time of alopecia was not compatible with an usual AE. Moreover, because the A/T ratio of our patient was significantly decreased, and a normal anagen-to-telogen ratio is characteristic finding of AE (5, 8) the diagnosis of AE was excluded and lesions were diagnosed as DAE. The prevalence and severity of alopecia usually depend on the drug as well as individual predisposition (2, 9). Upon the cessation of drug therapy; follicles resume their normal activity within a few weeks. Mitotic inhibition apparently stops the reproduction of matrix cells, but it does not permanently destroy the hair follicles. Hair regrowth occurs after 3-6 months (8). Hair regrowth of our patient began within three weeks of completion of combined therapy and completed four months later. Because PEG-IFN-α-2a/RBV therapy has primarily an immune-modulating effect, we thought that late starting time and comparatively faster regrowing time might be related to less toxic follicular effect of PEG-IFN-α-2a/RBV therapy compared to very toxic chemotherapeutic agents such as antimetabolites, alkylating agents and mitotic inhibitors. It has been stated that PEG-IFN does not increase the incidence of alopecia compared to standard IFN therapy (36% vs. 32%). Because most of reported AU cases were caused by pegylated IFN (1, 10), this alopecic effect might be related to the pegylated form of IFN. The alopecic effects have been seen in approximately one-third of patients receiving PEG-INF/RBV and particularly in cases receiving PEG-INF-α-2b (10). However, our patient was treated with PEG-INF-α-2a. The authors stated that some of them were reversible, while some cases were irreversible. Patients with reversible AU received long-term treatments, while irreversible cases received very short-term therapies less than fifteen weeks (10). Therefore, we think that the alopecic effects of therapy are unrelated to the cumulative doses or treatment duration. Occurrence of this type of alopecia is considered unpredictable; however, some factors such as psychiatric, endocrine or metabolic disorders may increase the risk of developing this condition (1, 10). On the other hand, neuropsychiatric side effect is one of the relative contraindications of INF therapy (10); therefore, from when the patient was diagnosed with psychiatric disorder, we continued therapy closely monitoring her. Thereafter, autoimmune thyroiditis and rheumatoid arthritis were diagnosed for the patient. Consequently, the patient developed DAE. The association between alopecia and thyroid disorders or thyroid autoantibodies had been documented previously, especially in AA in a ratio of 8-28% (1). Our patient exhibited a positivity of anti-TPO antibody associated with initiation of alopecia and the positivity continued to persist after stopping the treatment and even after the patient completely recovered from the alopecia. On the other hand, IFN-α treatment has been clearly linked to the exacerbation or occurrence of several types of autoantibodies or autoimmune diseases (thyroid disorders, hematological disorders and insulin-dependent diabetes mellitus) or diseases involving altered cell-mediated immune functions (inflammatory dermatological diseases, nephritis, pneumonitis and colitis) (1). Moreover, it has been stated that PEG-INF might induce immunological modulation (shift from a T helper-2 immune-driven response to T helper-1) and might stimulate synthesis of Th1-cytokines such as IL-1, IL-2 and INF-gamma and increased cytotoxic T cell activity (1, 3). Furthermore, in all reported cases, alopecic lesions developed after the viral clearance (10). Similarly, in our patient, RA and HT developed after the viral clearance. Therefore, we think that accompanying disorders might have been caused by PEG-INF/ induced-immunological modulation. Additionally, except for our patient, there is no example of PEG-IFN α -2a/ RBV induced DAE and enough information to describe its clinical or histopathological features, and even about its pathogenesis in literature. Therefore, we have no exact explanation about the mechanism. However, in the light of previously mentioned immunological effects of PEG-IFN-α-2a/RBV therapy, we think that our patient’s DAE might have been caused by insult of increased cytotoxic T cells to anagen hair follicles. PEG-INF a-2b /RBV induced alopecic effect is reversible, but regrowth of hair can take one year after completion of treatment (1). We think and speculate that the regrowing time can be related to affected hair-cycle, severity of damaging effect of the therapy within the follicular matrix, the subtypes of PEG-IFN and even individual predisposition, similarly to the shedding time. Additionally, in the light of clinicopathological and trichogram findings of our patient, we think that DAE cases can be incorrectly assessed as TE, DTE, androgenetic alopecia or AA according to their clinical appearances. Therefore, the diagnosis of DAE must be kept in mind when facing with any alopecic condition, especially in patients receiving antiviral therapy. However, further investigations are needed to clarify this issue. In conclusion, alopecia is one of the adverse effects of PEG-IFN treatment, independently subtypes. To the best of our knowledge, our case was the first reported one in the literature for PEG-INF α-2a/ RBV induced DAE. Authors' Contributions: Kamuran Turker and Betul Tas designed the study. Murat Ozkaya, Aysel Caglar, Ebru Tas and Umit Seza Tetikkurt contributed to provision. Kamuran Turker and Betul Tas wrote the manuscript.